Although many historians believe that Napoleon died of stomach cancer, the truth is that he was poisoned. Those investigators, who also believe that he was poisoned, theorize about the identity of the murderers. Nobody was sure of what happened to Napolen, but the Masters of light have revealed the truth of Napoleon's death once and for all. Interlocutor: Now I’ll move on to the mystery of Napoleon Bonaparte. Concretely, was he poisoned like some historian suggest? Ruanel: Yes, he was poisoned. Ruanel: Correct. With accumulated arsenic. Interlocutor: I understand. Now, the problem is that a hair analysis has determined that he had received the biggest arsenic dose before he was confined in the Island Saint Helena. Ruanel: The problem is that he was not poisoned in that place. Ruanel: No, he was poisoned a long time before. Interlocutor: Who was the murderer? Ruanel: People he thought were trustworthy. Ruanel: One of them was a woman very close to him and the other was a very well-known marshal. Interlocutor: In what year did they begin poisoning him? Ruanel: Four years before he was deported to the island Saint Helena. Interlocutor: Were these only two people involved or there was more? Ruanel: There were two other people. Interlocutor: How did they poison him? Ruanel: With a small dose of arsenic, but they were so small that it was impossible that Napoleon felt any trouble ingesting them. Interlocutor: Then the poisoning was accumulated slowly? Interlocutor: The woman you mentioned, Was she the Emperor's lover? Interlocutor: And was this marshal very close to him? Ruanel: Yes, he was one of the principal marshals. Interlocutor: Who were the two people that were aware of the matter? Ruanel: They were two lieutenants of the marshal who was conspiring. Interlocutor: And the reason? Was it a crime of Passion maybe? Ruanel: No, it was directly a political murder. Interlocutor: Nothing else than a political murder? Interlocutor: Did that woman have political motivation also? Ruanel: They had promised her good economic rewards. Interlocutor: Did the poisoning continue in the island? Ruanel: No, in the island there was no poisoning. In the island Napoleon had an enormous relapse due to the arsenic he had accumulated in his organism. Interlocutor: Let’s see if I understand. Napoleon Bonaparte died of arsenic poisoning and this was the only cause of his death. Interlocutor: Was the governor of the island involved? Interlocutor: According to my research, Napoleon had the idea that he had the order to poison him. Ruanel: No, I repeat it; the governor didn't have anything to do because the organism of Napoleon had sufficient quantity of arsenic to kill him when he arrived to the island. He was deadly sick when he arrived there. Interlocutor: Didn’t the governor know that Napoleon had been poisoned? Ruanel: No, not at all. It was a secret among those four people nothing else. Interlocutor: So, definitely the governor of the island was completely innocent? Interlocutor: The French Count Charles Montholon has been accused also of his death. Ruanel: No, he didn't have anything to do with it. Interlocutor: Concretely, then, neither the English governor of the island, Hudson Lowe, nor the French count Charles Montholon, were aware of the conspiracy? I insist on the question to remove any doubt completely. Ruanel: Correct, both of them were innocent, because they didn’t participate in the conspiracy and they didn’t know anything. Interlocutor: But Weren’t they antagonistic to Napoleon? Ruanel: Yes, but they didn't intervene in the concrete fact of his assassination. Interlocutor: Let me guess. 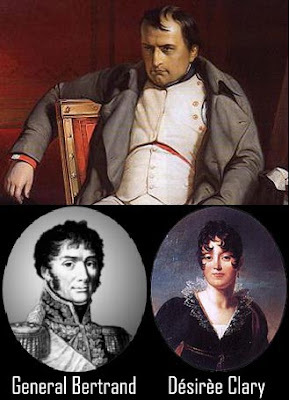 Was the woman who poisoned him the most famous lover of Napoleon? Interlocutor: It’s quite strange that Désirée had conspired against her lover. Interlocutor: Then was she only the executioner? Ruanel: Correct. They told her a thousand things to persuade her. They assured her that Napoleon would fall into disrepute and then she would be executed. Interlocutor: That is to say, in definitive they put her between the sword and the wall? Interlocutor: Could we say that it was a matter of survival for her when she accepted to be the executioner? Interlocutor: Summarizing, all the investigations that were made on Napoleon's poisoning are real, although they made a mistake about the place and the characters? Ruanel: That’s right. When the investigators considered erroneously that the poisoning happened in the island, they didn't have any other choice to suspect of the governor. But as I already said he didn't have anything to do. Interlocutor: If the doctors that assisted him in the island had known that he had been poisoned, Would he have been saved? Ruanel: No, because the arsenic dose accumulated in his organism was too big. In the moment he was deported he was already condemned to death. Interlocutor: I’d like to clarify if his death was accelerated by the medical treatment, because some investigators speak of medical malpractice. Ruanel: No, discard that, Napoleon died simply because he was poisoned. Interlocutor: Definitively the English men didn’t have anything to do with his death? Interlocutor: End of this topic, then? Interlocutor: Well, I believe that the truth about the emperor's death was properly clarified. I have one more question. Was Napoleon really a great strategist? I ask it because I read an article saying that he was a humbug who took the credits for himself which were in fact of the generals who were advising him. Ruanel: No, he was not a humbug; he was a genius of strategy. There are detractors everywhere. Interlocutor: Would it be something more to add? This entry was posted at Thursday, October 15, 2009 and is filed under History . You can follow any responses to this entry through the .